The Options dialog is displayed by clicking Tools | Options. It allows you to customize aspects of the working environment. 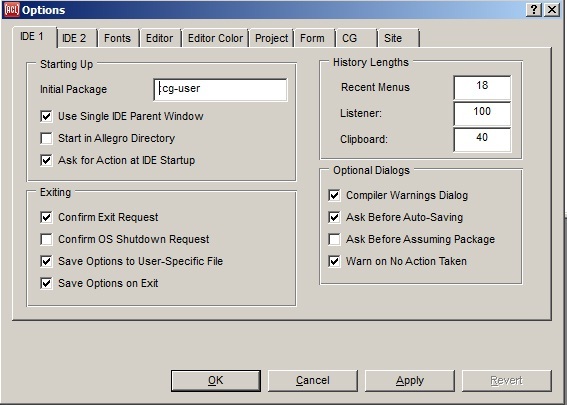 Changes that you make using the Options dialog (or the configuration object) are saved to the file allegro-ide-options.cl when the Tools | Save Options Now command is used, or when the IDE is exited if the Tools | Save Options On Exit option is enabled (as it is by default). When you restart the IDE, it will be configured as it was when options were most recently saved. OK: Effect any changes made to any tab and close the dialog. The changes are applied to the currently running Lisp. The options file is not modified by this action. Cancel: Cancel any unapplied changes and close the dialog. Apply: Effect any changes made to any tab but leave the dialog open. (The options dialog is not modal.) Cancel does not undo applied changes. The changes are applied to the currently running Lisp. The options file is not modified by this action.